Another subscription-based MMOG is jumping on board the free-to-play train: EverQuest II will be launching optional F2P servers. After Dungeons & Dragons Online and The Lord of the Rings Online went free-to-play, it was only a matter of time before another major MMOG followed suit. This time around, it's the younger brother to one of the grandfathers of Massively Multiplayer gaming, EverQuest II ... sort of. You see, EQ2 will still continue to operate its normal servers as per usual, with a traditional subscription-based model as its background. But SOE will also be launching special servers for EverQuest 2 Extended, a version of the game that will let players download and play the entire game through The Shadow Odyssey expansion for free. Naturally, it's not all free: Certain races, classes and spell tiers will be locked from those free-loading F2P-ers, and you'll need to plunk down cold hard virtual cash if you want access. The item shop will also have the standard goodies we've come to expect from F2P titles like potions and accessories that give you a small extra boost. Obviously, the most interesting part of the change (and what most glaringly sets it apart from contemporaries DDO and LotRO) is that it separates F2P gamers and subscribers into what are essentially separate games. This isn't a bad idea, really, as it means that you'll only have to balance subscribers against subscribers and free players against free players rather than cross-pollinating. If there's a downside, it's not immediately obvious. 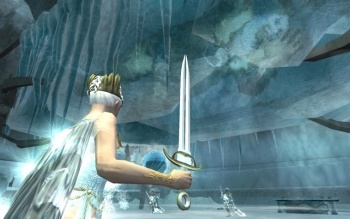 A game going free-to-play is traditionally seen as an indication that it is foundering financially. Of course, given that DDO started raking in the bucks after it went F2P, and given that SOE isn't abandoning the subscription model entirely, this could just be a case of testing the waters to see if they're full of sharks, or money.